Lately I have been loving lipstick and accumulating quite a few. My problem is that I always just throw them into my makeup bag or purse and then the disappear for a few weeks and I forget I ever had the. I know what you’re thinking and the answer is yes, every day is like Christmas when you lose and find things as often as I do. 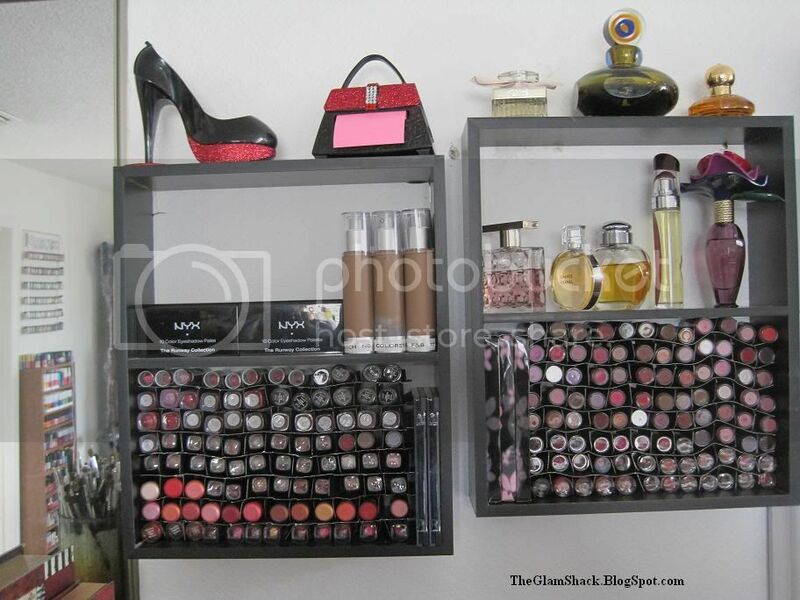 But, I am trying to get that under control which means it is time to organize my lipstick collection! I just love acrylic displays. They are so simple and all your attention is on the objects on display, like lipsticks or nail polishes. This little display is sort of brilliant! I’m pretty sure with a drill and the right bit you could DIY this thing in no time flat. But for only $15 it might be worth it to just buy the thing. This blogger just took a box they already had and DIYed the dividers. This creative blogger took apart a shoe box and put it together with leopard duct tape to make this pretty lipstick storage box. 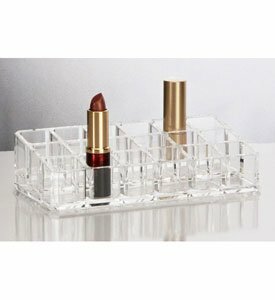 Again, I love acrylic storage solutions! You can see all your pretty things inside! This would probably be better for lip gloss than lipstick since they would have to be on their sides. How smart is this?! Super portable, won’t take up a bunch of room and you can see everything right there in front of you! I love this idea! This little container holds 50 lipsticks upright, I want it. This is so easy and so smart. 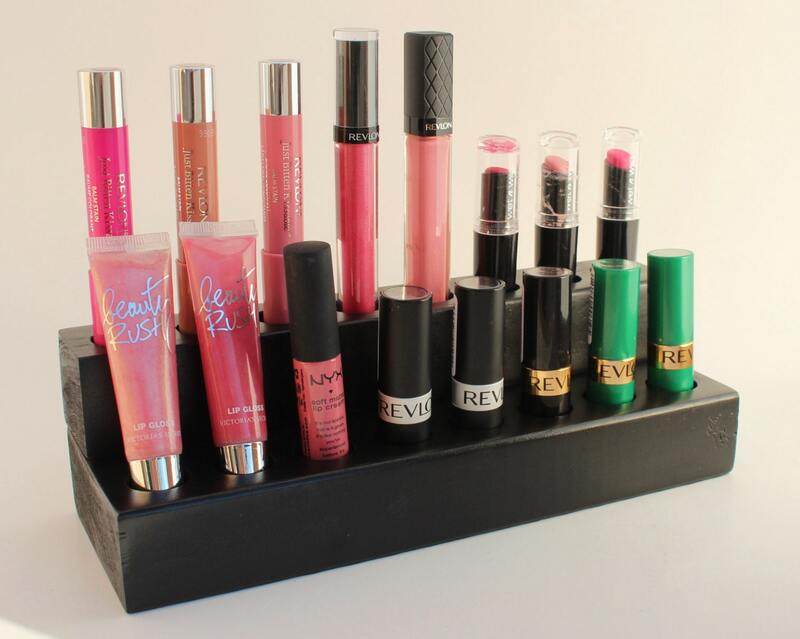 This clever blogger cut her lipstick/lip gloss poxes in have and stored them in a decorative box. This blogger DIYed their own dividers and just put them up on a shelf. So smart! She has a pretty impressive lipstick collection, don’t you think?! This blogger bought their drawer dividers. I have scoured the internet and I cannot find them anywhere! If you know where I can find them, tell me! This is carousel organizer that you can buy at any craft store or you can get a plastic one from an office supply store. This blogger used a bunch of smaller plastic containers in a drawer. I like this idea if you like to keep them separated by brand or color. 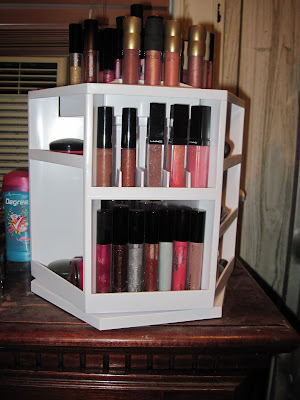 This entry was posted in Beauty, Makeup, Organize on February 27, 2013 by Heather. Hi! I’m the blogger from the last pic. Thanks so much for linking to your source, I really appreciate it. By the way, those green boxes in my drawer are actually rifle shell casing boxes I got from a hunting supply store! Crazy huh? Hey Alyson, thanks for reading, and you are welcome for linking the source 🙂 That is BRILLIANT to use the rifle shell cases! I might be needing a few of those! Hey Janice! Thanks for reading, and THANK YOU for the link to the partition boards! I searched high and low and couldn’t find them! So there’s another option for you. Great ideas. Thank you! I now know what I need to do with my lipsticks..
Just a query, have heaps of Maybelline and the only way the nudes can be identified is the label on base. 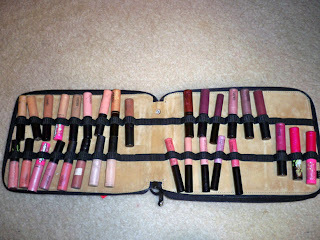 I s it ok to store lippy’s upside down.